What if you could find a variety of Christian homeschool resources all in one place? There are so many resources out there it’s easy to lose track! CHSH-Teach.com offers a variety of homeschool resources including freebies, devotionals, helpful homeschool information and even a forum to connect with other homeschool families. We have recently been using a variety of resources from the CHSH Download Club. 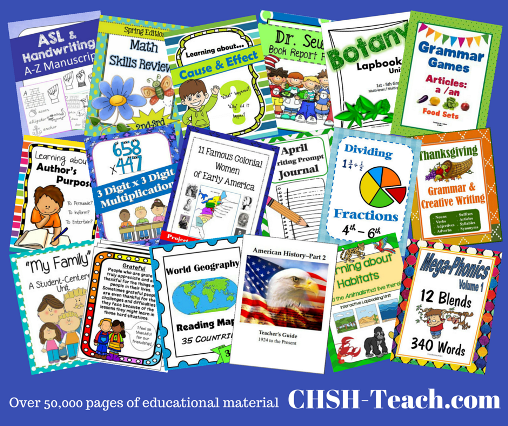 CHSH-Teach.com offers over 50,000 downloadable educational and Christian homeschool resources. The Download Club is a subscription based resource within CHSH-Teach.com. There are two subscription options available – the Annual Subscription (which we received for our review) and the Lifetime Subscription. With the Annual Subscription members receive unlimited access to the subscriber only downloads for a full year whereas Lifetime Subscription members will always have access as long as its available. The Download Club can be accessed directly through your CHSH-Teach.com account online. Simply sign in, and you can access all of the downloads! From there you can download them to your computer, save them on your tablet, etc. There are so many ways you can use the downloadable resources. A variety of worksheets can be printed out to be used and solved as well as helpful posters for the wall. There are also resources that are just handy to have on hand like book lists, reading charts and logs, etc. If you lack wall space, saving those resources for easy access for viewing when needed! There are also books for reading as well as books for reference which may not be ideal for printing out given the number of pages. For those type of books, I save them to our iPad to easily access them when we need to look at or read them. Files can also be downloaded and used later when needed! The CHSH-Teach.com Download Club covers all grades (Pre-K – 12th) and subjects. There are Christian homeschool resources including Bible verse memorization, Bible Flashcards, Bible Notebooking and Games, Sermon Notes, Copywork and more. These, alone, I found to be such a valuable resources as we incorporate Bible into every homeschool day. Of course, all kinds of subjects are covered like Language Arts, Foreign Language, Arts & Crafts, Music, Math, Science, Social Studies, Electives, and Health. Phew! That’s a lot, right? I was definitely impressed. I admit, at first, I was also overwhelmed. Where to start? I was glad to discover the downloads are sorted to be able to access just what you need. They are sorted based on a subject or by grade level. It even has resources sorted by seasons and organization as well as a “Miscellaneous” category, which I haven’t yet explored. My personal preference was to search by grade level. Although we don’t necessarily focus on grade levels in our homeschool, I knew it would give me a good starting point to look at the resources to see if they would be a good fit. You can search for resources by typing a key word into one of the search boxes, which is great when you know exactly what you are looking for. I thought I would focus mostly on the Kindergarten resources for our youngest, but I’ve been using a little bit of everything for all three kids. I found resources that filled holes I wasn’t aware we had. The resource books are wonderful. Plus, I printed out a few coloring pages and games. We have been sprinkling these resources into each homeschool week. I think Christian HomeSchool Hub is great Christian homeschool resources. The Download Club offers so much plus there is a community. It’s more than just the worksheets, books, and posters. It’s an opportunity to connect with other homeschoolers. If you have resources to share with the community, you can add them to the Download Club for others to access as well! Plus, I love that within the Download Club there are resources particularly for the parents as well. I am not only able to print out and save things to supplement our homeschool, but I have found the parent resources helpful as well. They offer “How To” resources, forms for planning and record keeping and calendars. It covers a little bit of everything! They even have helpful groups on social media to further connect with others! 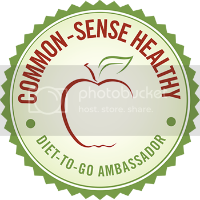 Would you like to see how other members of the Schoolhouse Review Crew have been using CHSH-Teach.com? Find out by clicking on the banner below to access all the reviews!